Rapid population growth has helped fuel Latinos’ increasing electoral participation. According to the Census Bureau, 50.5 million Hispanics were counted by the 2010 Census, up from 35.3 million in 2000 (Passel, Cohn and Lopez, 2011). Over the same decade, the number of Latino eligible voters—adults who are U.S. citizens—also increased, from 13.2 million in 2000 to 21.3 million in 2010. However, even though more Latinos than ever are participating in the nation’s elections, their representation among the electorate remains below their representation in the general population. In 2010, 16.3% of the nation’s population was Latino, but only 10.1% of eligible voters and fewer than 7% of voters were Latino. This gap is driven by two demographic factors—youth and non-citizenship. More than one third of Latinos (34.9%) are younger than the voting age of 18, a share greater than that of any other group. And an additional 22.4% are of voting age, but are not U.S. citizens. As a result, the share of the Latino population eligible to vote is smaller than it is among any other group. Just 42.7% of the nation’s Latino population is eligible to vote, while more than three-in-four (77.7%) of whites2, two-thirds of blacks (67.2%) and more than half of Asians (52.8%) are eligible to vote. Even so, the number of Latino eligible voters will continue to grow in the coming decades as a steady stream of U.S. born Latinos becomes eligible to vote by turning 18—more than 600,000 did so annually between 2006 and 2010. Yet, even among eligible voters, Latino participation rates have lagged behind that of other groups in recent elections. In 2010, 31.2% of Latino eligible voters say they voted, while nearly half (48.6%) of white eligible voters and 44.0% of black eligible voters said the same. This gap in participation—17.4 percentage points between Latinos and whites—has persisted in recent midterm election years, though it is down from a record 19.3 percentage points in 2006. 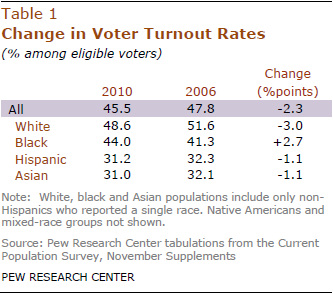 A similar gap in voter turnout rates between Latinos and whites exists in presidential election years as well (Lopez and Taylor, 2009). Latino voter turnout rates lag other groups partly because of the large share of Latino eligible voters that are under 30. In 2010, 31.3% of Latino eligible voters were ages 18 to 29, while 19.2% of white, 25.6% of black and 20.7% of Asian eligible voters were under 30. Historically, young people have voted at lower rates than older eligible voters. And among young voters, Latinos have had some of the lowest voter participation rates—in 2010 just 17.6% of young Latino eligible voters voted (Center for Information & Research on Civic Learning and Engagement, 2011). In contrast, among Latino eligible voters ages 30 and older, the voter turnout rate was higher—37.4% in 2010. However, among older voters the gap in voter turnout rates between Latinos and whites—16.9 percentage points—is nearly as large as it is between all Latino eligible voters and all white eligible voters—17.4 percentage points. The gap in voter participation between Latinos and others is also partly due to fast growth in the number of Latinos who do not vote but are eligible to do so. Between 2006 and 2010 the number of Latino voters increased by 18.8%, but the number of Latino non-voters increased more rapidly, by 25.0%. Just as with other populations, differences in voter turnout rates exist among Latino eligible voters. In 2010, Latino college graduates had the highest voter turnout rate (50.3%) among Latino eligible voters, while young Latinos ages 18 to 29 had the lowest (17.6%). Differences in participation rates also exist by country of origin. Nearly half (49.3%) of Cuban-origin Latinos voted in 2010 compared with 29.6% of Puerto Rican-origin Latinos and 28.7% of Mexican-origin Latinos. Similarly, a greater share of naturalized foreign-born Latinos than native-born Latinos voted—36.6% versus 29.2%. Voting Age Population: Persons ages 18 and older. Registered Voter Population: Persons who say they were registered to vote in the 2010 election. Voter Population or Voter Turnout: Persons who say they voted in the November 2010 election.